Hand across luxury with White Dental Beauty Teeth Whitening Patient Kits. 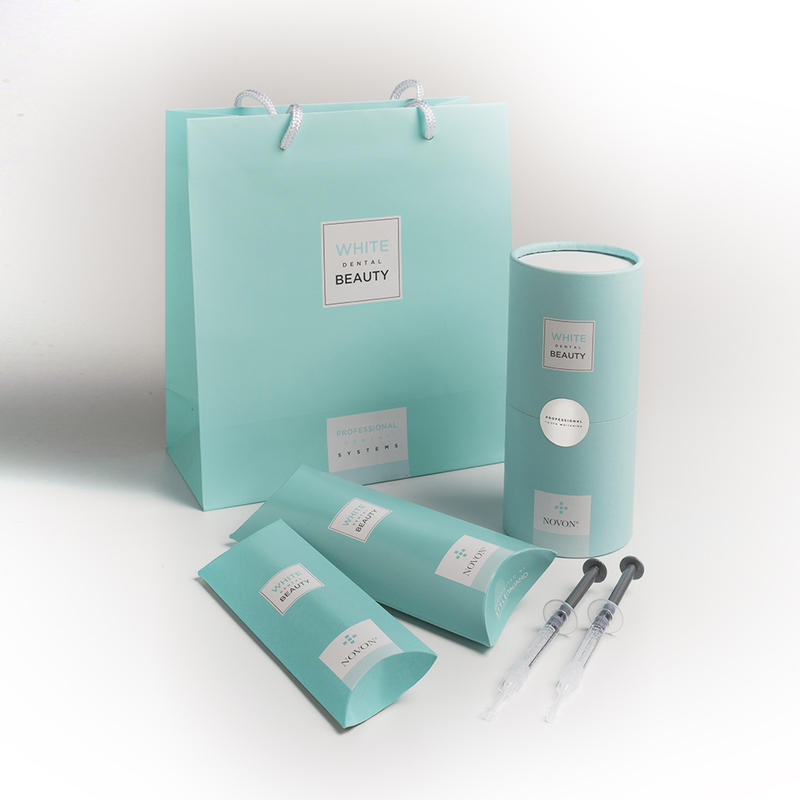 Hand across luxury with White Dental Beauty Teeth Whitening Patient Kits, perfect for patients who care about the quality of their whitening gels. 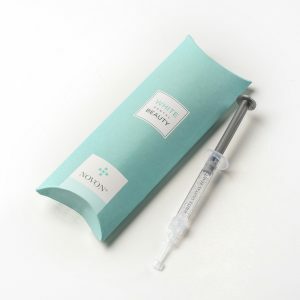 Each Patient Kit contains the required amount of whitening for approximately two weeks of whitening. The 6% Hydrogen Peroxide is equivalent to 18% Carbamide Peroxide and is the strongest at home whitening solution allowed by EU Regulations and is recommended to be used for 30-90 minutes at a time. The length of full treatment is prescribed by the dentist. Due to its advanced stability, this gel can be stored for over 24 months between temperatures of 2-24°C. You can now have your logo on your patient kits! 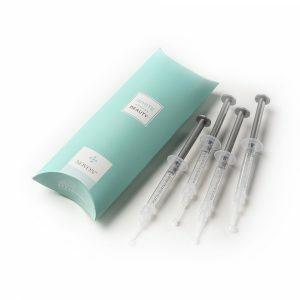 Optimise your marketing potential and present your patients with personally branded treatments by customising your kits. Call 01943 605050 to find out more. White Dental Beauty is a worldwide leading teeth whitening brand, renowned for providing high quality, innovative and clinically reinforced tooth whitening products. 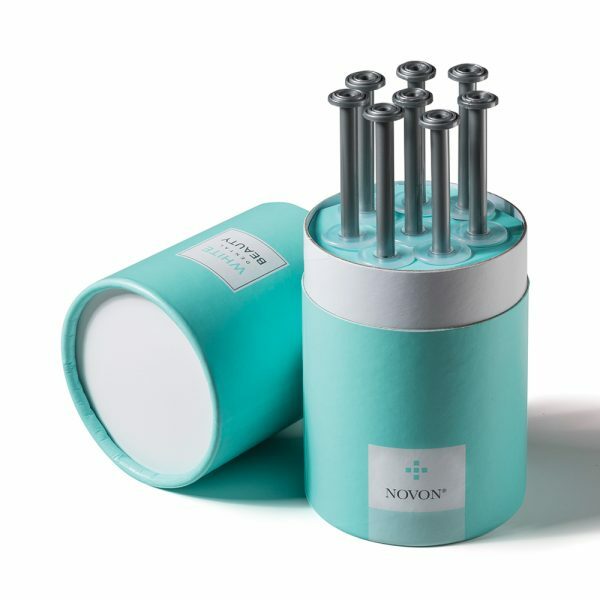 NOVON® is the whitening compound used by White Dental Beauty to deliver higher quality teeth whitening results in the same time – and with less immediate sensitivity. What is NOVON® and how does it work? NOVON® is the active ingredient in White Dental whitening gels. It is a whitening compound containing Hydrogen Peroxide, urea and sodium tripolyphosphate which produces a pH jump into the alkaline pH range upon application. 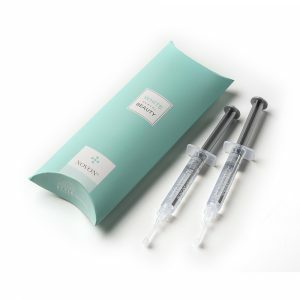 This''pH jum'' enhances the release of perhydroxyl ions for a faster whitening effect. What strengths are available and what are the wear times? White Dental Beauty gels are available in four different strengths, which determines how long each gel should be worn for during each application. There are four strengths available: - 6% Hydrogen Peroxide: the strongest EU accepted gel, wear from as little as 30-90 minutes a day - 16% Carbamide Peroxide: high strength gel, wear from as little as 1-2 hours a day - 10% Carbamide Peroxide: the original strength for overnight gels, wear for 2-4 hours a day or overnight - 5% Carbamide Peroxide: a mild gel for people with sensitive teeth, wear for 2 hours per day or overnight Higher strength gels often achieve results faster, whereas lower strengths reduce the risk of sensitivity. Can patients with sensitive teeth whiten? Whitening with Peroxide has often been a barrier for patients with sensitive teeth. 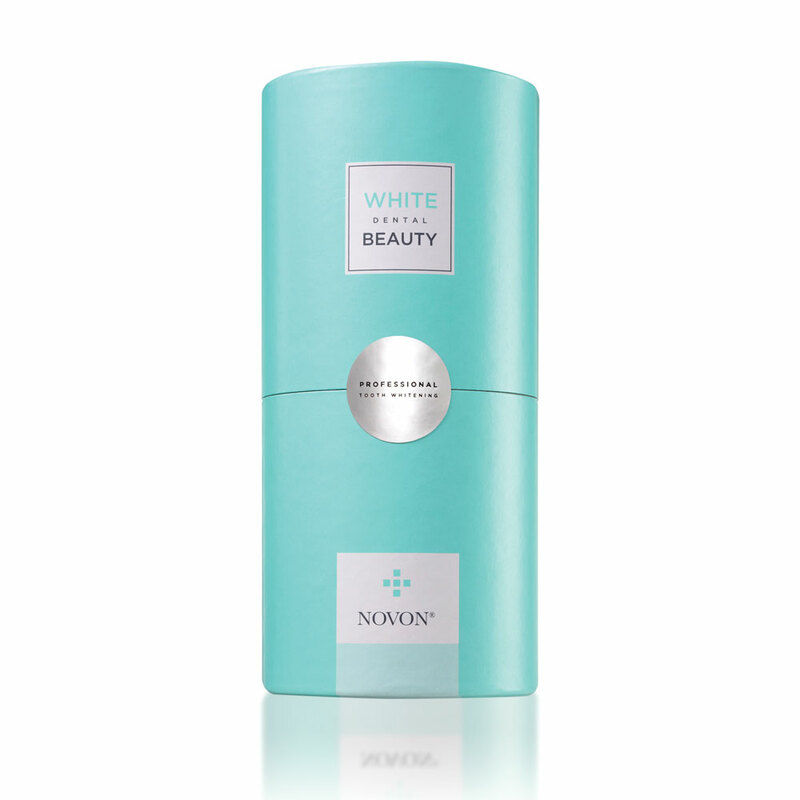 With the help of NOVON®, White Dental Beauty offers these patients the ability to whiten their teeth using an extra mild formula containing 5% carbamide peroxide. Although the gel contains lower levels of peroxide, it can achieve the same results as a standard 10% carbamide peroxide gel. This means teeth are less exposed to the sensitivity issues higher concentrations can cause* and means patients with sensitive teeth can whiten their teeth comfortably. *A new three-component formulation for the efficient whitening of teeth (Carbamide Plus) Hyland et al Clinical Oral Invest (2015) Carbamide Plus is now known as NOVON® All White Dental Beauty gels carry a high water content to prevent dehydration of the tooth which is believed to help with sensitivity and provide consistent, reliable results. For best results, how long must the gap between bleaching and bonding be? How do I store my White Dental Beauty kits correctly? As they do not need to be stored in the fridge, we recommend keeping them at a temperature of between 2-24 degrees centigrade to ensure the best results. Each kit also has long shelf life of up to 24 months. Do White Dental Beauty gels contain animal products and are they certified Kosher? Does White Dental Beauty contain p-phenylenediamine? There's no P.P.D. in any of our products. This means you can comfortably whiten your patients' teeth, despite any allergies to this chemical.